Aella is another one of our Eijerkamp breeders. We acquired her just over a year ago and can’t yet say whether or not she will be a quality breeder, but she most certainly has the background and conformation to become a top producer. We have several of her offspring on the old bird race team this year and will race them from Chochrane (700 km). Her father “Redouan“, a son of “Kain” x “Athena”, was a top racer for Eijerkamp. He is an Eijerkamp van Loon x Eijerkamp-Janssen cross. The van Loon x Janssen cross has been “gold” for the lofts in Brummen. 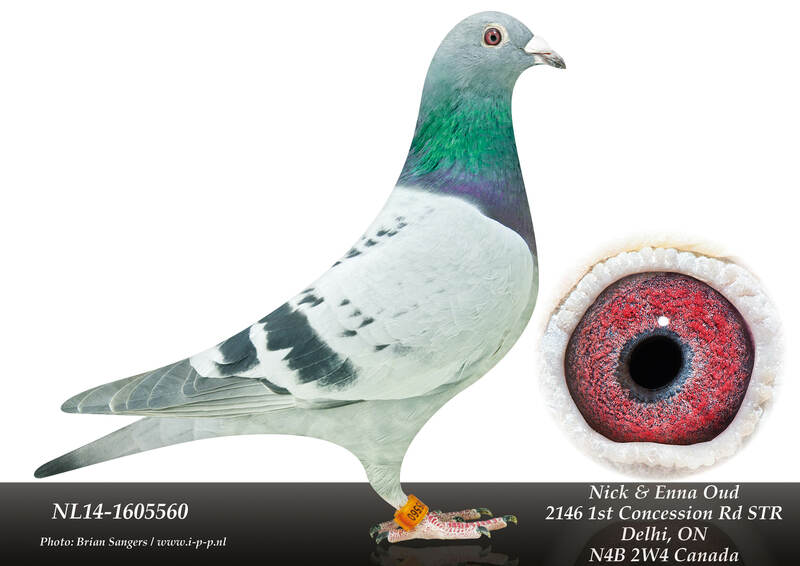 Producing both ace pigeons and better yet ace breeders. Her mother is “Joni“, a daughter of “Gideon”, another van loon x Janssen cross who was 7th National Ace Pigeon One Day Distance for the Fond Speigel 06-08. “Joni“s mother is “Antje”, a hen out of top Koopman lines.